What inspired you to create Good American? When I started thinking about and exploring the opportunity for Good American, it was clear that so many women are ignored by the fashion industry, and I wanted to create a brand that bridged this gap. At the same time, I was pregnant with my daughter, so it was really important to me that I build a company not only I would be proud of, but she would be proud of too. I was very passionate about starting a company that was focused on inclusion and at first it wasn’t just about denim. I thought about the market differently and wanted to create clothes in a range of sizing beyond what many brands were already offering. After connecting with Kris Jenner and Khloé Kardashian, I came to Khloé with the idea of creating an inclusive brand and immediately, she was in. When we reached $1 million in sales on launch day, we knew we were creating something truly amazing. How has working with your partner, Khloe Kardashian, helped build the brand? What are the benefits and challenges of having a partner in business? Khloé is an amazing partner. Khloé and I are both very specific about the way the product looks, feels and fits, and we think about our product range from different points of view and offer unique perspectives. Khloé is the kind of partner that I can speak to honestly and candidly about everything, which really streamlines our decision-making process. One challenge is that people can dismiss Good American as just another celebrity fashion label. However, the mission of Good American extends beyond one person. We celebrate all women and empower them to look and feel their absolute best. Since we’ve launched, we’ve seen the support and love of our brand from women across the world, and know that’s due to the extraordinary fit, quality and style of our clothing, as well as our brand values. What differentiates your brand from others in your market? First and foremost, it’s our design approach. We’re not a trend-based fashion brand, we make amazing fitting clothes that are really classic pieces that you can layer with more fashion. I believe that Good American really is different because not many fashion brands can say they are fully inclusive, and we are proud to be a pioneer in the space. We are also a benefits brand, meaning that everything we make has a benefit through the design. We approach product development with our customer’s needs in mind, with a fit-first philosophy. Most importantly, we always make sure our clothes fit and feel good, and our denim has no gaping, tugging or sagging - problems that are common among other denim brands. How have your children motivated and inspired you to create? Well - children are expensive, I need to stay motivated to work and pay the bills!! Haha!! What are your favorite go-to fashion brands? I wear a lot of Frame and Good American of course, and I also buy classic pieces from Céline, Balenciaga, and Chanel. What values do you hope to instill in your children? I think it’s important that my children develop a strong sense of empathy for others, especially in the times we’re living in. I really try to make sure that my children know they live a blessed life and I talk to them a lot about the charity work I do with Women for Women international and Baby2Baby, and all of the people I meet through that work. What are your favorite go-to activities in LA for Moms? I like taking them to LACMA because I feel like there’s something for all of us there but my children’s favorite spot in Los Angeles is the Venice Boardwalk, and then onto Santa Monica Pier to the old arcades! They will watch the skateboarders at the Venice Skate Park for as long as I’ll let them. Then, we’ll walk to Santa Monica to the pier. They love playing the games, working hard to collect as many paper tokens from their winnings as possible. I let them buy something completely useless from the arcade shop, but they’re so happy and excited about it! My very dear, very old friend, Jamie Sigler, whom I love and adore for her openness, honestly, kindness, loyalty, and realness, has joined forces with her great friend Jenna Parris to start her next chapter, a must-listen podcast called Mama Said! What’s better than listening and feeling included in a conversation on the challenges and celebrations of motherhood from moms who really get it!?! I find that women, when embarking on motherhood, feel so isolated, and sometimes guilty for their struggles, but Jenna and Jamie are here to let you know, it’s all normal and it’s all okay. We are in this together, and it ain’t easy! Tune in and join their journey of hot topics that arise along the way- laugh, cry, and get involved. These ladies are here to stay..
Lara Björk, a talented, seasoned art consultant, has launched a new business that both kids and adults can appreciate. The Letters NYC, are a series of artful alphabet portraits, covering multiple cities, using each letter to match with an iconic, artful place/landmark within the city. Lara comes up with the letter references and visuals and her partner illustrates them, using bright colors that appeal to children of all ages. These special works of art are wonderful baby gifts and birthday gifts, and each comes with their own explanation sheet to teach your children the meaning and history behind the art. Lara has partnered with the Soho House to create a new weekend activity called “Kids House,” where children can express themselves through art and creation with her team, we are excited to try it out! As you all know I am sweating puddles over at Tracy Anderson on a daily basis, and sitting in that sweat for about 2 hours through classes. I always thought that cotton was the most breathable material to wear during my workouts, however I was sorely mistaken. After a long and informative interview with the very inspirational, Stacey Hunter, founder of Quo Active Gear, I learned that the undergarments I’d been wearing cause bacteria which lead to infection. Although it’s not the most glamorous topic, the truth is when we sit in our sweat for extended periods of time, women are prone to yeast infections and urinary tract infections, both incredibly painful and undesirable. Quo undergarments are made with science in mind, ensuring that even if we sweat for a long time, the underwear absorbs the wetness, decreasing the chance of bacteria forming. I wear them everyday, and I can attest to them being life-changing. Quo is also coming out with a full line of athleisure in the same amazing fabric very soon! Olive & June - Nailed It! I’m very particular about my manicures and pedicures. I love the look of a clean polish, and always have a difficult time finding places as good as my favorite NYC salon, when traveling. Well, luckily, in LA, Sarah Gibson Tuttle has opened they most zen, beautiful nail spa, called Olive & June. Sarah created the perfect environment for clients to go and feel at peace, rested and relaxed while getting their nails done. From the chic florals that hang off the walls, to the beautiful chairs and stools, every inch of this space was carved out with serenity in mind. They offer an all natural experience, and have the cutest nail stickers, as an added service, that are very cool for both adults and kids. My manicures and pedicures at Olive & June are always long-lasting, and never chip, so they get 5 stars in my book. We all know I have an affinity for vintage. I am obsessed with puffed sleeves, intricate laces, and gold lame! What’s really special about vintage finds is that they are done with a craftsmanship we rarely see in current times. I love knowing that when I wear my vintage dresses, I won’t have to worry about seeing someone else in the same outfit. There is also something whimsical and important about statement pieces, and the best ones can be found at Happy Isles Salon. This incredibly well-curated shop, is about the experience. You go and select from a wide assortment of dresses, jewels and accessories and play the best dress-up imaginable. It’s like being a kid in a candy store, for a vintage lover like myself. You leave the salon with a complete look, head to toe, with pieces that will never go out of style. I’ve never been one to find time for meditation. Many people have told me how crucial and life-altering it is, however I find it difficult to find free time in the day, and I’m not willing to wake up any earlier! Getting into a meditation studio would take off hours of my day, which would frankly just give me more anxiety. Unplug Meditation has found a solution for people like me, and I was fortunate to speak about it with owner, Suze Yalof Schwartz (who also hadn’t meditated until her mother-in-law told her she needed it!). Suze offers drop in classes and private sessions in her space, but even better, she offers a time-saving Meditation App where you can be guided into a meditation at any time, any day, with her expert coaches. I met with Camilla Sacre Dallerup for a mini session of crystal reading and aromatherapy. Her abbreviated 20 minute session helped alleviate my high anxiety with a full day of work shoots ahead of me, and was the perfect start to my day, leaving me with a clear, positive outlook. Camilla also gave me a few meditation tips and tricks to do with my children at home to keep them calm and ease tantrums. They worked! If there were ever a girl to get me moving and grooving, it’s workout/meditation/spiritual guru, Heather Lilleston. Heather is a force! Her energy and spirit is so positive, welcoming, and infectious. She is an all-around lifestyle coach if you ask me, and wherever she goes she spreads love and good vibes. Heather is best known for the Yoga for Bad People retreats, however if you get her on the dance floor, watch out. Girl’s got moves! Her newest venture is Magic Hour, at the chic, airy, Knockout LA studio space. She teaches a combination of dance, yoga, and meditation that will get your body and mind ready for Summer. 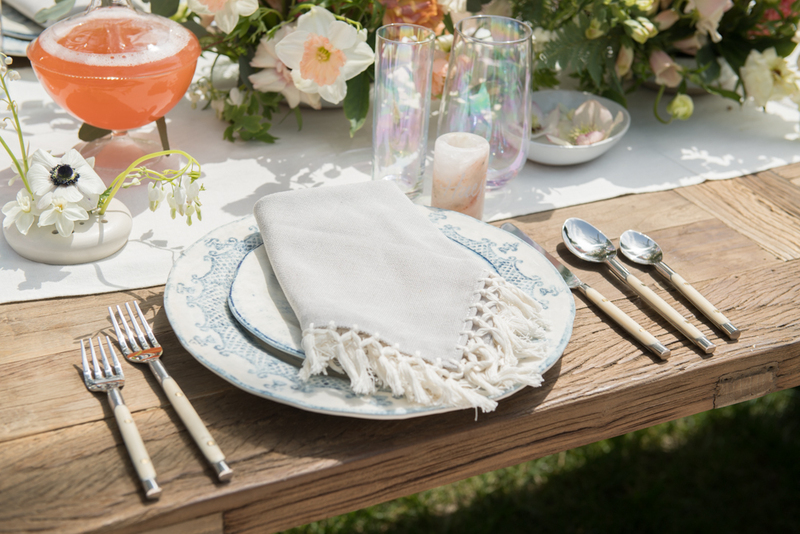 Stefanie Cove and Company - It’s All In The Details..
Stefanie Cove sets a table like no other. She plans parties all around the world, each having one thing in common, they are breathtakingly beautiful. 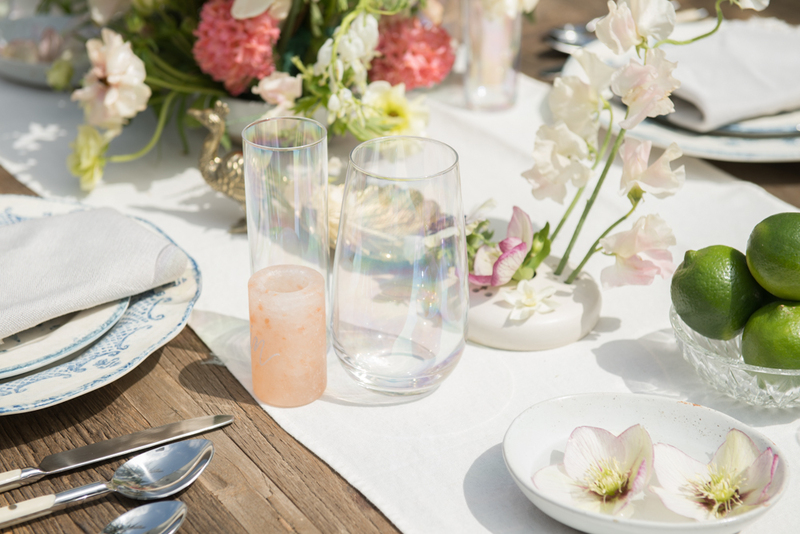 Her mix of plates, glassware, linens, vases, flowers, and unique personal touches make for some serious eye candy. Her specialty is the relationships she’s forged with her clients, taking time to truly know their personal style and using that to make their parties special and memorable occasions. My favorite aspect of Stef’s work is her attention to every detail. There are always little surprise elements on the table that put a smile on her clients' face. Stef always goes the extra mile to make her parties a time to remember, and her creativity is astounding. I look forward to collaborating with her on something beautiful in the future, as she is my entertaining guru, and a true icon in her industry. You know how the saying goes, “you are what you eat,” well if that’s true, I’d like to be one of Annie Campbell’s platters! Annie, a former actor, decided that food was her passion about 7 years ago, and her company was born. Annie designs the most spectacular food platters, from fruit and cheese, to vegetables and dip, whatever she creates is a masterpiece. Annie and her husband work together to create the perfect party from start to finish, covering table design, decor and catering. Each party is unique, and thematic in the chicest way, always delivering eye swooning photos of mouth watering plates! I can sit on her Instagram for hours in awe of her creativity, and the beauty of each table she sets. Annie is as cool as they come, the kind of girl you can easily be friends with, which makes her perfect for the entertaining industry. Atop a beautiful mountain in the Pacific Palisades, overlooking the Pacific Ocean, with a distant view of the Santa Monica Pier, there is a private utopia called Surya Spa. I have never had an experience quite like this. The treatments take you away to another place. Whether it be the 4 hands hot oil massage, or their rejuvenating facials, Surya relaxes you in a way that is unparalleled, and I truly did not want to leave. It’s the best retreat, particularly for mothers to step away and feel completely refreshed. They have the most incredible food, and prepare a healthy, nutritious lunch, that complements their treatments to perfection. This would be the ultimate mother/daughter getaway, and best present you could ever give a pregnant woman for during pregnancy in preparation for delivery, as well as postpartum to promote healing and boost immunity. Martha, who has studied Transcendental Meditation, and is devoted to the roots of Ayurveda, creates personalized oils for each client, so the experience is always unique. This feature was by far my favorite experience to date, and I hope you all get an opportunity to go try it. When I heard the story behind this jewelry collection, I was moved! Romy, the founder and designer, had lost her Dad, and wanted to give her Mother something special, signifying her Father, to hold close to her heart. 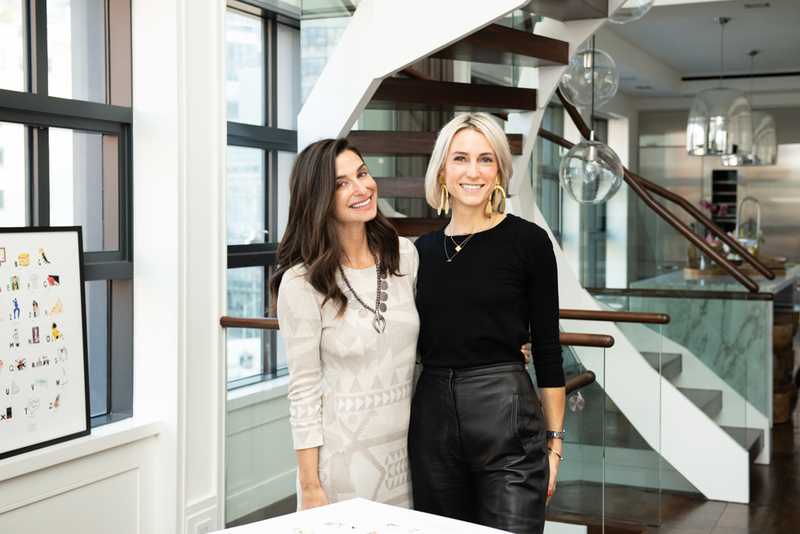 She designed a gold necklace with his signature on it, and her company was born. It doesn’t get more personalized and unique than this gift, as everyone’s handwriting is quite different, and also holds so much of a person's character. For Mother’s Day, my girls wrote out the words “Gaga,” “Mama,” “Sister, Sister,” and “BFF.” We are now taking orders online to customize necklaces with these phrases as a collaboration with Sincerely (in your children’s handwriting) and we cannot wait to see them on everyone! To order your own custom necklace, visit this link. Use code MAMATATA at checkout to received 10% off your order. Every year, on Mother’s Day, for as long as I can remember, my mother wanted a robe! She was in love with silk robes, and wore them every evening after a long day of work. I remember when we were little, Tata and I used to shop at all of the lingerie stores in our neighborhood searching for the perfect one, back when brick & mortar was still the primary mode for shopping! Now, it’s a lot easier, and the woman who does it best is Helena Quinn! Her robes are like works of art, something to feel great in at home, or even wear out with jeans during the day. Her prints are very special, and now she does custom monogramming, as well. Her “Mama” robes really spoke to me, when I saw them online, and it was the perfect Mother’s Day gift for my Mama, and we also added one to our cart for Tata! Upon stepping into Robin Berman’s L.A. office, I immediately felt a sense of calm. I was in a safe zone, an environment that made me feel at ease and ready to talk. I imagine this is what all of Robin’s clients experience while being in her care, and hence why she has been so successful in her field for the past 15 years. Robin, who previously had a private psychiatry practice, used her knowledge and education to help guide parents in her book “Permission to Parent.” She is a “Parent Consultant,” helping others overcome their fears and insecurities on a daily basis, to become less judgmental, less guilty, less critical parents. In a world filled with “hyper parenting,” and an eagerness to be the “perfect parent,” Robin helps dissect where those feelings stem from, and then focuses on simplifying schedules in an effort to be more present with your children. Her mantra is “worry less, enjoy more!” and I’m into it! When I think of L.A., this company is at the forefront of my mind. 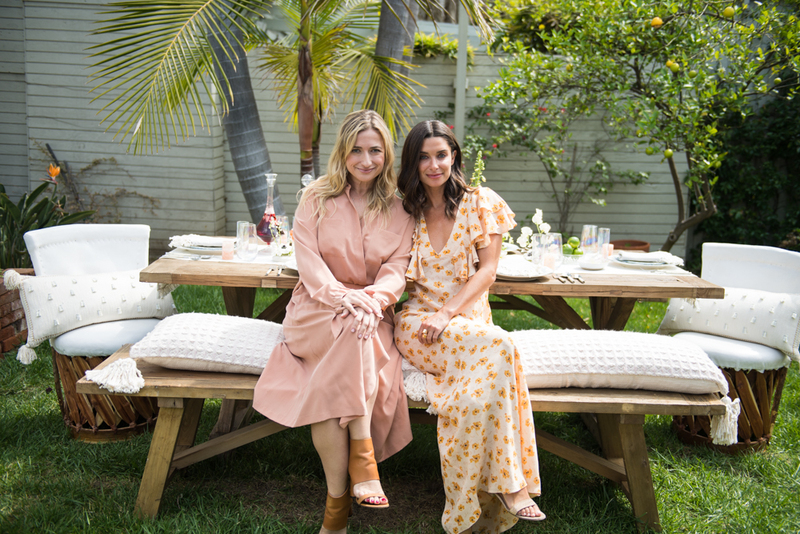 Monrow, the super chic, comfortable, simple, leisurewear line, was hatched by Michelle Wenke and Megan George in L.A. and their aesthetic is very in sync with the lifestyle and environment around them. Their clothing is my go-to for when I’m on the road with my girls, and want to be comfortable, yet look put-together and cohesive. Their sweatpants and sweaters are tailored, not frumpy, and actually allow you to feel attractive in your mommy gear! They’ve recently launched Monrow Mini, Monrow Men, and Monrow Classics, expanding their brand organically to appease all of their customers. I love twinning with my girls in their patterned hoodies and sweatpants. I was really inspired by Michelle and all of her hard work to create a brand from the ground up while being a mom. Not only does she have Monrow, but she recently founded Tribe West, a beautiful collection of baby mats/yoga mats in a variety of prints and colors. With all of the unattractive, bright, baby mats out there, these are majorly refreshing! As women, particularly mamas, we are all familiar with the pains and challenges our bodies endure both during and after pregnancy. I have suffered with numerous complications related to my deliveries that kept me struggling in my first months of motherhood, and at the time I had nowhere to turn. Between my urethral prolapse and my retained placenta, my hormones and sensations were completely out of whack. Dr. Allison Oswald opened up a clinic in Brentwood that would have saved my day. I want to provide all mothers with this resource to learn about your bodies and find balance. Allison combines her knowledge of the pelvic floor muscles, with physical therapy exercises, and pilates to strengthen and lift the pelvic floor in an effort to bring it back to it’s original place. Allison Oswald is an incredible woman, with a very special, calming, soothing energy, making her the best in this field. Go book an appointment, and thank me later! All of my friends were raving about their glowing skin after seeing this one facialist in L.A., so I had to go see for myself! I’ve had my fair share of sun exposure, and quite honestly I doubt I’ll ever stop basking in the sunshine, so in an effort to avoid wrinkles, fine lines and sun spots, I’m been taking preventative measures by trying many types of facials. Our late 30s and early 40s are when skin damage becomes visible, and our faces seem more sunken in and dehydrated. Vanessa taught me so many tricks that were inexpensive and accessible. All of the products she recommended for daily maintenance could be found in one click on amazon.com and sent overnight. Vanessa’s facials are not invasive and uncomfortable, instead they hydrate and plump up the skin using various infrared lights, gold collagen masks, and oxygen. She had me in her room for 45 minutes and I came out looking like a whole new person, refreshed and rejuvenated. I will forever pay her a visit each time I’m in town. I was completely in awe of Dr. Cara Natterson upon meeting her in LA. This woman does it ALL! I’ve actually never met anyone this accomplished and brilliant, and yet charismatic and compassionate. I literally left her home with a stack of books I could hardly carry, all written by her, to help parents understand the different developmental stages of their children’s lives, and provide them with tools for each of them. She has parenting down pat, and I was just sucking in the knowledge! Cara is a mother, and author many times over, a pediatrician and a master of health and wellness for tweens and teens. Her most recent book, Worry Proof, give us insight into stress-free parenting with Dr. Natterson’s practical advice for every childhood struggle. My other favorite book she wrote was for boys going through puberty. There has been no other written material on this topic, and it’s so helpful for boys to also have help during this transitional phase of life. I could sit and listen to her words of wisdom for days, so if you are a parent in L.A., I advise you to take in her wisdom and her knowledge. What inspired you to start a kombucha company? I discovered my love for holistic and fermented foods, like kombucha, while I was in graduate school for nutrition at Tufts University. Eating fermented foods just made me feel so good and helped me develop my philosophy on health: that it really comes down to what makes you happy. I stuck to that philosophy, but didn’t realize it would be my professional calling until I found myself in corporate America in my late 20’s feeling unfulfilled, but knowing that I wanted to make a more substantial mark on the world. I formed an entrepreneur club with my now-husband, Justin, and best friend, Vanessa and as we sat around, sipping on my home-brewed kombucha trying to come up with the Next Big Thing, we suddenly realized the idea was sitting in front of us all along! A few weeks later we were in the Brentwood Farmer’s Market and Health-Ade was born! 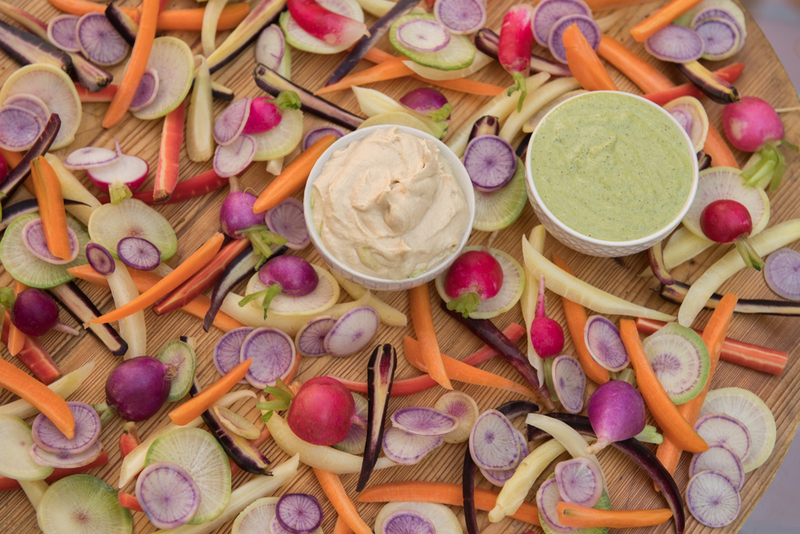 What are your healthy snack tips? How did your son inspire your business? Well, the business started before I had my son, so he didn’t inspire it, but being a mom has no question made me a better CEO in two ways. First, motherhood is demanding, so I'm forced to delegate work and elevate above it to lead, and direct instead. Not only does more work get done, it’s done at a higher quality. Second, motherhood is so emotional—you love your child like nothing imaginable, so the emotion tied to work becomes a little less important. I used to say Health-Ade was my baby—and it was, but nothing like Hendriks is my baby, of course. This is a good thing for me, because the less emotion I can have when making decisions at work, the more effective they are. Now I can more clearly and decisively make a call for the business and save my emotions for 6pm, when I rush into Hendriks’ arms. What are your favorite healthy, family-friendly restaurants in LA? Just like becoming a new mom has no rule book, entrepreneurial adventures have no “steps.” I’m sorry to say, but there is no right way to do it. The important thing is that you DO do it. That you believe in yourself. You prioritize the time. And you figure it out, one challenge at a time. You will have to manage your expectations when taking on more responsibility—you can’t do it all. Expect to take some risks and make sacrifices. For example, you might not be able to make dinner during the week anymore, you might need to hire a nanny that can do the shopping and the laundry, and you might have to miss those girls’ nights for a while. But if you’re dedicated and strategic, you can do just about anything (just not everything) you want, AND be a mom. What are your favorite weekend activities with your son in LA? Anything with him is my favorite, that’s why I love the weekend. One thing we love to do is hop on a bike and head west along Bollona Creek bike path (we get on by Centinela and Culver). It heads through the Marina, where we stop to skip stones on the water and look at boats, and finish up at the beach, where Justin and I will crack a can of good Rosé or bottle of Health-Ade and watch Hendriks run around in the sand. We usually always get on our bikes as a family on the weekend. I also love going to the Mar Vista farmers market. I find when he picks out the food, he’s more likely to eat it. We also love just chilling at home, since during the week we don’t get to enjoy it as much. What is a typical family meal in your home? I used to cook six nights a week. But now the demands of work and motherhood together are too much, and I was losing my mind trying to do it all! Now, I’m so much happier. 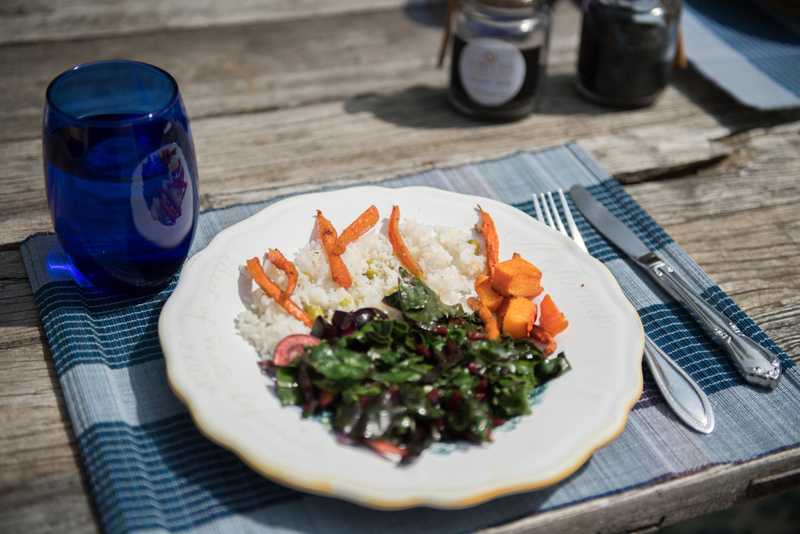 During the week, I rely on my nanny to make fresh food for Hendriks, and Justin and I order our meals from Klean LA, a delicious, healthy and organic fresh meal delivery service. I love to cook, but this is something I had to give up during the week and save for the weekend. So dinner during the week is done in less than a minute—we heat up some food from the nanny for Hendriks, and Justin and I heat up our healthy and fresh ready to eat meals from Klean LA, and we eat together. I’m not wasting any more than one minute preparing food, and every extra minute at home is spent with Hendriks, which is what I wanted. On the weekend, we have fun cooking. We pick out our favorite recipes and usually get creative. Justin LOVES to grill, so we’re usually grilling some kind of meat or fish. A typical Saturday dinner meal might be grilled salmon marinated with ginger/soy/green onions, my roasted smashed potatoes with dill, and sautéed broccoli loaded with roasted garlic. Hendriks loves to partake in our weekend dinners all the same. We don’t drink during the week much anymore, so the weekend meals are when we enjoy beautiful wine, where I’m not afraid to splurge anymore. After all, if I’m only having one glass—it better be damn good! So many females inspire me. Oprah, obvio. But more locally Carbon 38 founder Katie Johnson, Hedley & Bennett founder Ellen Bennett, celebrity fitness trainer Lacey Stone—who literally gets my confidence levels back up to “level full” EVERY time I see her. How do you spend your “me” time being so busy with your growing business and family? This is a struggle, but it’s my focus for this year and I’m happy to report it’s going well. I am working out 4-6 days a week, for one. And this was hard for me because I could never find the time. I’ve realized you CAN find the time, as long as you’re willing to get up early and be flexible. I go to a 45 min Flywheel (spin) 3 times a week at 6AM and then use Aaptiv (a workout phone ap for running and at home HIIT exercises) every other day. Aaptiv is perfect for moms because even if you only have 10 minutes, there’s a workout for you! Just commit to every day, go to sleep early, and you can do it. I also give myself a massage every other week, which as long as I plan it out, works. If it’s too hard to get to the spa for this, I get one to come to me after Hendriks is asleep. I LOVE PRIV, a mobile service app that will bring top notch facials, massages, hair styling/makeup, and even workouts to your home or work. Finally, I spend three minutes in the first hour of being awake and three minutes in the last hour of the day meditating and marinating on what I’m grateful for. I have a “I am” statement I read every morning that reminds me of what I want out of life. It centers me. For me, the best part of all of this is it hasn’t cut into my motherhood or work time much at all—it does take extra support from my husband, who has to be home getting Hendriks ready when I’ve gone to spin class, but he’s happy to do it I think because he sees how happy it makes me. Plus I always repay the favor whenever he needs time off. When I met with Shira, I understood immediately why people gravitate towards her for advice and guidance. She is bright, warm and incredibly easy to talk to. Her new book, The Food Therapist, hits the shelves in a few days, and I have a feeling this will be a best seller. 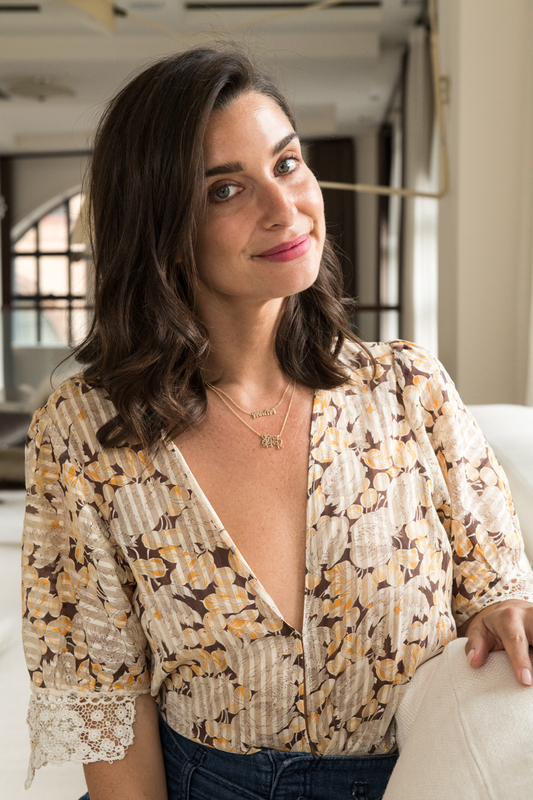 Shira is a nutritionist and dietitian in L.A. She has spent her career breaking her clients' bad eating habits and helping them find healthy relationships with food. When I sat with her, we discussed my own personal struggles with food, as we all have this complicated relationship. She informed me that when I overindulge in a “snack” day, not to stress about it because the stress will make me indulge more, and therefore have an undesired effect. She let me know that it’s important to succumb to our cravings, and be okay with it, and then get back to our healthy habits. I still have a lot to learn so I’m excited for the regimens and recipes in Shira’s book to help me along.